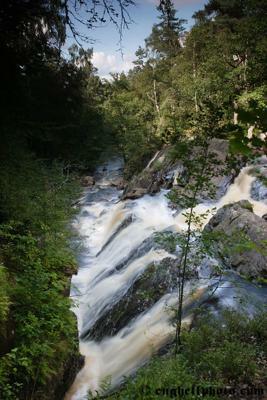 Danska fallet (Danish Falls) is situated in Simlångsdalen a valley east of the city of Halmstad in Halland on the Swedish west coast. After a nice walk through the woods you will get to the falls which is easy to view from different angles. The name “Danish Falls” is said to come from after Danish troops fleeing from Swedish troops after the last battle between Denmark and Sweden in Halland 1676, were falling into the falls when a bridge collapsed leading to several Danish soldiers’ death. That’s what the legend says, if it’s true, I don’t know.